Mark and I have been members of North Fresno Church for nearly 40 years. There is a group that meets monthly called Primetimers--those who are retired, or at least wish they were retired. 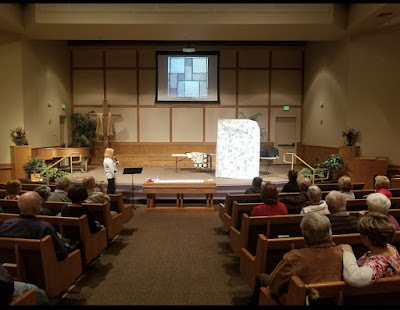 I was asked to present my quilts last week at their March meeting, and was honored to do it. I think most people who have known me for nearly four decades (what???) were surprised to see me getting up in the front of the sanctuary and actually doing public speaking. It surprises me as well! For a couple of Sundays prior to the presentation, there was even an insert in the bulletin. The Sunday before my presentation, Gabriel grabbed a couple of the inserts and did some art work. He chuckled the whole time he was embellishing this one: moustache, goatee, big ears, large glasses. But then he also gave me this one. Given the fact that I have actively avoided any and all public speaking for most of my life, until about two years ago, I was surprisingly calm and actually had a good time. Mark was my quilt-holding assistant. I have made this presentation several times, but always out of town. Considering that most of my inspiration comes from places in and around Fresno, it was fun to mention them and know that the audience knew what I was talking about. 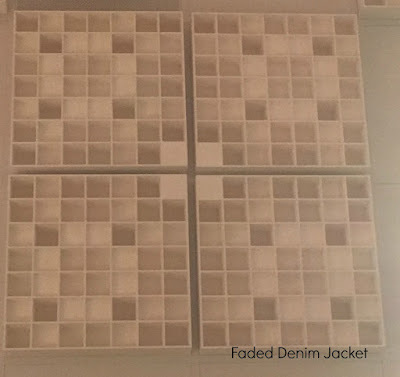 At one point I had them look up at the ceiling, at the acoustical tiles. 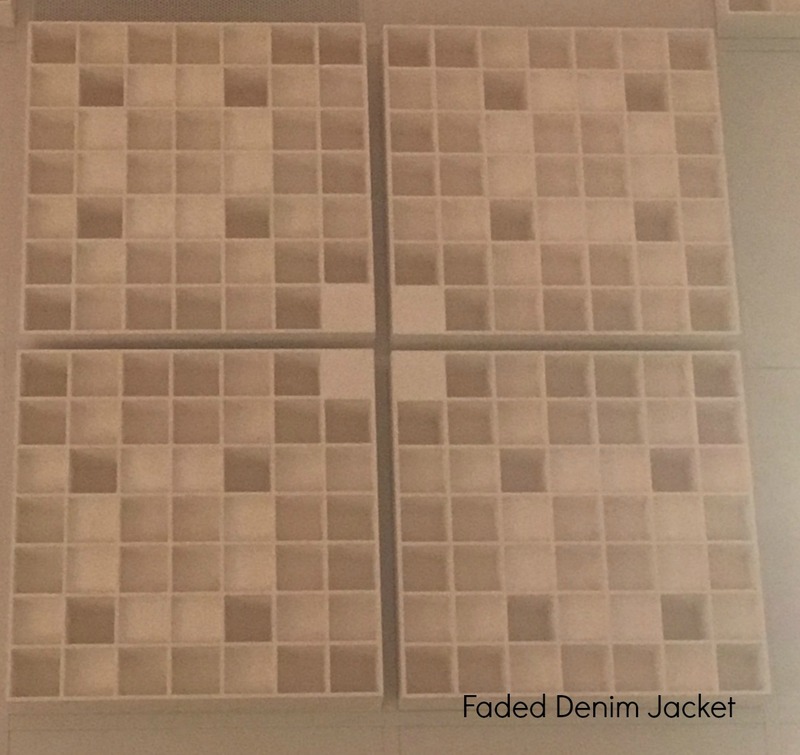 That inspiration turned into my Faded Denim Jacket quilt. 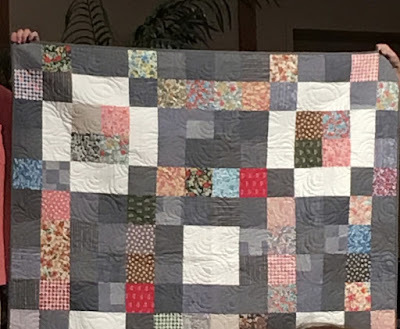 One of the best comments later was when one of the men told Mark that he had been around quilting for years and wondered how I could possibly talk about quilts for an hour. So he was surprised when I showed my inspiration photos and then showed the quilt that resulted from that inspiration--he found it interesting and informative. Success! I had such a good time. And it just goes to show that once again the "never say never" adage holds true--never in my wildest imagination could I have seen me doing any public speaking and actually enjoying it! I'm looking forward to the next presentation. Congratulations on a successful presentation. I think it is harder in front of people I know because they will see me again and again and again. With strangers, I don't have to worry if I make a mistake. Funny things I think of. NEVER!!! It looks like a fun and successful presentation.